Cash. Credit. Debit. Cheques. There have been lots of discussions on different expat forums about foreign currency exchange and the right way to go about exchanging your hard earned money. Everyone has his or her own exchange style, and in the end it’s best to go with the method you feel most comfortable with. When it comes to getting the most bang for your buck, we’ve put together the best options to help you decide where to exchange your money. Similar to transferring money from your home bank to a foreign one, Forex makes it easy to wire money abroad for use in a different currency. Typically available 24 hours a day Monday-Friday, forex providers offer the most competitive exchange rate with little to no barriers for entry and no minimum transaction size. For example, in a quick sampling of transferring $1,000 USD to AUD, with a major bank you would probably get $1,315 AUD but with a forex provider you get $1,358. There are plenty of companies offering this service so a little research needs to be done to get the best rates. TorFx is one such forex company to be considered. Personally, any time I can pay by credit card, I will. Similar to taking out cash at an international ATM, you’ll receive the best rate of exchange for that day – the wholesale exchange rate. As an organizational bonus, I like being able to login to my online bank account and immediately see what the purchase cost me in Canadian dollars. Lots of credit cards these days also don’t have a foreign transaction fee, meaning you can use the card freely abroad without any additional charges. The one downside to relying on a credit card is that not all businesses take it as a form of payment. In those times, as a tip: NEVER take out cash from an ATM with your credit card. Aside from the outrageous charges your bank is likely to ding your account, you’ll also be paying interest immediately upon withdrawal. I recommend always having a few foreign dollars on hand for those cash-only moments. Currency bureaus are easily the most expensive way to get foreign funds. Many airports, hotels and malls will have a foreign exchange desk, but you’re likely to pay an abundance of fees and commission rates – up to 20 percent. Always proceed with caution, plan ahead and try to avoid kiosks when possible. A helpful website for viewing exchange rates is www.xe.com. Check it out before doing any foreign currency exchange to ensure you’re getting the best possible rate. Whether you decide to use your debit card, an ATM or your credit card, always check first to see if there are any foreign transaction fees associated with it. Using plastic to get money is a favorite exchange method across the board. Most banks will have a fee for taking money out at an ATM (i.e. $5 per withdrawal or similar) but even so, it tends to be a good option. Before traveling, check to see if your bank has international partners (i.e. Scotiabank from Canada, Bank of America from the USA, and Westpac from Australia are all partners of each other and waive most fees for usage abroad). If you’re moving overseas, it might even pay to switch to one of these banks. Before you leave, don’t forget to tell your bank about the country(s) you plan to relocate to, and ask to increase your withdrawal limit if you plan on taking out large sums of money at one time. * And always use ATMs in a secure, safe area of the city. One of the safest and most secure ways to obtain foreign cash is by ordering it ahead of time through your home bank. Luckily enough, regardless of where you’re heading to in the world, banks have the ability to purchase foreign funds at a wholesale rate. That being said, the rate when you pick up the cash may not be the same rate as the day you ordered it. You may end up paying more than expected, depending how the rate fluctuated during the week. Another thing to watch out for are the fees. Yes, banks like their fees. Ask about extra charges included in ordering, delivering and exchanging money before you place the order. Travelers cheques are a safe, easy way to protect your money. Oftentimes they can be purchased in USD, EUR, AUD and CAN and can be exchanged for local currency. You can enjoy the convenience and piece of mind that they will be replaced if lost or stolen, and you’ll avoid fluctuating exchange rates while traveling abroad. Travelers cheques are a funny thing nowadays though. As they decline in popularity, check ahead to see if (and where) cashing them in will be possible. It’s also good to know that the purchasing exchange rate is less than favorable compared to using your debit/credit internationally. You’ll also likely pay a fee for commissions, shipping, conversion fees and activation fees. Ending point: not a very profitable option, but good to use in emergencies. 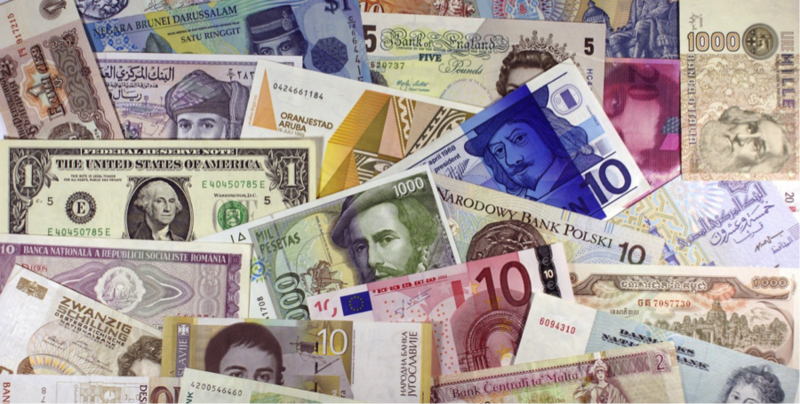 What method do you feel best using to exchange foreign currency?